Sometimes a fix for a problem really doesn't entirely solve the problem. And that seems to be exactly what happened to Philips Healthcare's Children's Medical Ventures business and its serious recall of apparently moldy infant head and body cradlers. 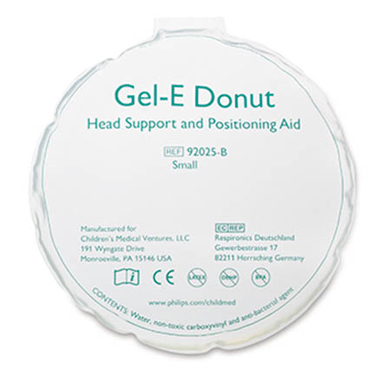 A Gel-E Donut, as shown on the FDA's website. The initial recall in May involved Gel-E Donut and Squishon 2 gel-filled products made and distributed from July 1, 2012 to December 31, 2013. The recall now involves devices made and distributed until August 2014--after Philips received 12 new complaints of visible mold on their devices, including one injury, according to the FDA. At the time of the initial recall, Children's Medical Ventures recognized that mold contamination was occurring on some products during the manufacturing process. It "implemented a process intended to reduce the presence of viable mold on the products prior to shipment," Philips said in a news release relayed by the FDA. "Because the process to eliminate the potential for mold growth has not been fully effective, the company is announcing this new recall." The FDA has designated both recalls as Class I because the neonatal intensive care unit (NICU) patients and pediatric intensive care unit (PICU) patients using the cradlers are much more sensitive to molds. The molds associated with the recall--Cladosporium and Penicillium Fungi--are both commonly found but can cause difficulty breathing or an allergic reaction. Cladosporium can cause skin, eye, sinus, and brain infections in weakened or critically ill patients. Children's Medical Ventures released a new Urgent--Field Safety Notice on October 10. Countries where affected devices have been shipped include the United States, Australia, Austria, Belgium, Canada, France, Germany, Iceland, Ireland, Italy, Japan, Kuwait, Netherlands, New Zealand, Norway, Portugal, Reunion, Romania, Saudi Arabia, South Africa, Spain, Sweden, Switzerland, Thailand, and the United Kingdom. More information is available on the FDA's website.